When people ask me, “What has been your biggest achievement?” I always reply, “That I managed not to go through a complete meltdown in 2007.” That was the year I got pregnant — and then got fired. I was living and working in Denmark at the time. I was three months pregnant and the breadwinner of my family when I heard the news that I was being fired. That same day, I was escorted out of my office without the chance to say goodbye to my colleagues. My employer did not provide me with prior notice; I was simply called into the office and told that I was being terminated. When this particular company first interviewed me for the role of senior VP of sales (before I had gotten pregnant), I was asked during the interview if I expected to have children. I responded that I didn’t know — but I also didn’t think much of the question at the time. I was unaware that although it is not technically illegal for an interviewer to ask those questions, it was (and still is) illegal to make a hiring selection based on someone’s answer to those questions. And we can presume that the answers to such questions formed the basis for a selection decision. Looking back, I should have left the negotiations right then and there; I should have turned down the job offer. But I took it. And 10 months later, I got pregnant and then got fired. After my termination, things only seemed to get worse. I spent the next 10 months fighting in court. I was plowing through my savings to pay for the legal fees, but I couldn’t just sit back; I had to fight. It was important to me to bring awareness to the issue of pregnancy discrimination. Despite a note from my doctor, despite witnesses and despite the plain and simple fact that I had gotten pregnant and then fired, the company still got the district court’s blessings to fire me — with no warnings and with no complaints about the work I was producing. Their decision was not just unkind; it was discrimination. 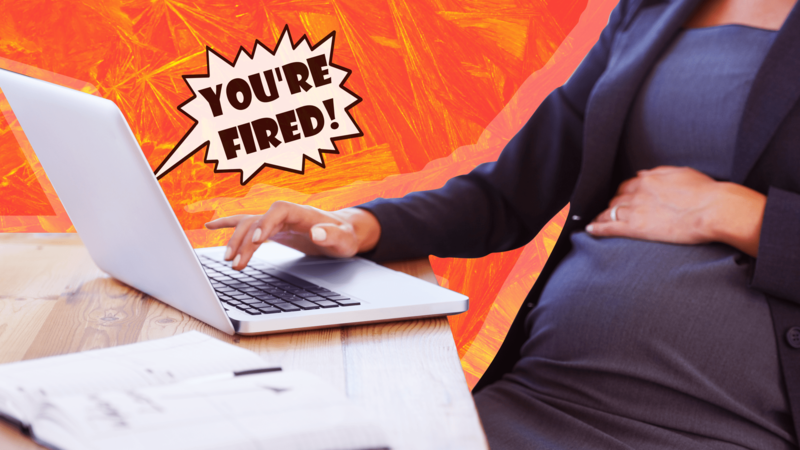 During my court battle, just in case it wasn’t stressful enough on its own, I was also scrambling to find a new job — and going through the interview process while becoming ever-more-visibly pregnant. Although in Denmark, employers are legally barred from treating pregnant women differently from other candidates (the same rules apply in the U.S. under the aptly named Pregnancy Discrimination Act), many career and legal experts today would say that telling a prospective employer you’re expecting a child isn’t always the best move. In my case, of course, keeping it quiet wasn’t possible; I was showing. I interviewed for VP of sales roles within several organizations — and I was what most would consider a top candidate. I smoothly landed dozens of interviews, and everything seemed to be headed in the right direction. I went into each interview confident — but then they wouldn’t call me back for the second or third round of interviews. I couldn’t help but wonder how my pregnancy was affecting my job prospects. Eventually, I’d had enough. I decided to make a life-changing decision: that no one, ever again, should be in a position to fire me. I decided to start my own business, and I was both driven enough and lucky enough to hit the ground running; my business began to thrive. Today, I work in more than 33 countries with some of the biggest companies in the world. ?And I’ve realized that while it’s impossible to avoid adversity, what is important is how you tackle it. Do you give up? Or does it make you stronger? Getting fired while I was pregnant did make me stronger — and helped me develop qualities and survival techniques that still play integral parts in my drive for success today. Adversity became the foundation for my leadership skills, my values, my ability to focus and my sense of responsibility. Having a career and life is all about having the courage to create your own luck — and not letting other people keep you down. So, yes, 2007 was a low point in my life, but it was also the year I found my path.